rec. 13–15 July 2015, Church of St Michael & All Angels, Summertown, Oxford. It isn’t very often that it's possible to listen to a CD right through but this is one such disc. There is such variety from track to track that interest is maintained — from mass movements to instrumental dances to keyboard works to songs to motets. 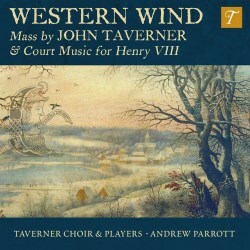 It's good to welcome Andrew Parrott back in this recording of Taverner masses. Some might recall his recording of the Missa Gloria tibi Trinitas as a liturgical reconstruction back in the late 1980s on EMI Classics. That disc is sadly no longer available. There are two or even three other versions of the Western Wind mass in the catalogue but neither mixes it with secular pieces. The Sixteen under Harry Christophers pairs it with various motets and the Te Deum (Hyperion CDH55056). The Tallis Scholars recorded it for Gimell (GIM207) and coupled it with music by Tye and Shepherd. The mass on this new disc is not divided up by yards of plainchant but, as can be seen below, by a successful mixture of keyboard pieces and a single chant. This gives a sense of space between the polyphony. The mass is probably the first by an English composer to be based on a secular song, a quite risqué one at that: “I wish my love were in me arms / and I in me bed again”. Track one has the beautiful and memorable melody played on a recorder. To hear a (shortened) vocal version you must wait until track twenty. It reappears in the last track which is an instrumental version in two parts. Actually the way the CD is planned out is somewhat odd. After the mass is completed (track 10) we are then treated to a row of secular songs and instrumental works like Cornysh’s astonishingly long (for the period) Fa la sol. This is before we move back to Taverner and two motets. You can track it as you want so my criticism is really unfounded but I’m sure you know what I mean. There is also a very accomplished piece by Henry VIII, oft recorded but played beautifully here. It's a dance entitled Taunder naken. Emily van Evera has recorded some of these pieces before including ones from the Henry VIII manuscript (c.1515) Yow and I and Amyas and one of my favourite songs of all time, Wher be ye my love on CRD 3448 on an album (I have the now defunct LP) called The Flower of all Ships. It was transferred to CD and if you can find it its well worth hearing. Her voice has not really changed. It is still highly expressive and clear with excellent diction. I really like the Taverner Choir’s performance of this mass. The Tallis Scholars are, as you might expect, smooth and suave. The Sixteen always move the tempo on, and they're beautifully balanced but sometimes miss the most expressive moments. The Taverner Choir has a wonderfully rich but precise sound especially the sopranos. I also like Parrott's pacing. The recording helps and the sound captured for the non-vocal items is gloriously spaced. This mass is more approachable than say Taverner’s O Michael or indeed the Gloria tibi Trinitas. The folksy melody is almost always present and weaves its way across the voices. It is especially to be heard in the superius. It is quite likely to be an early work written even before 1520. The motet Dum transisset sabbatum will be familiar to many but this version written as it is for four part men’s voices is unlike the usual one for five-part mixed voices. The polyphony in this version seems to me to be a little congested. This generously filled disc is equipped with all the texts. Andrew Parrott’s booklet essay goes through the disc item by item giving basic information as well as biographical background.